Men’s squash had a devastating loss against Columbia, while the women scratched out a win. The men came back and won over Navy (Photograph by Leanne Chin for The Triangle). 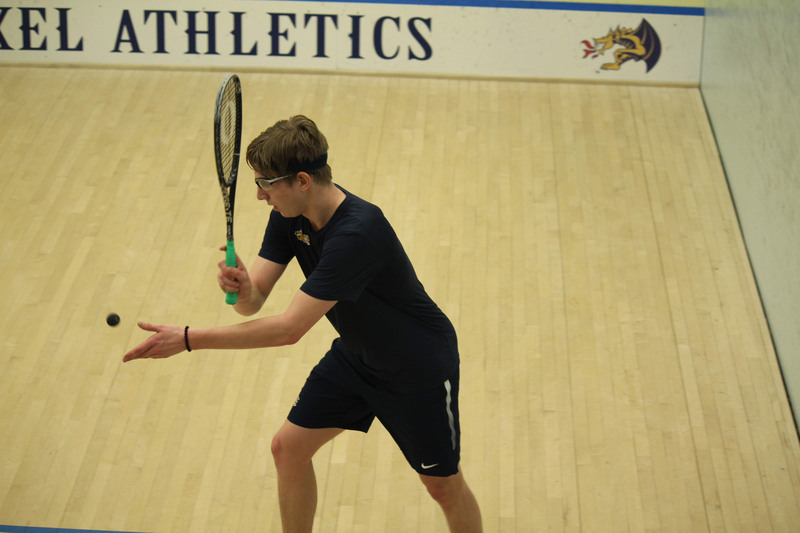 After such gigantic wins against Colby College, the Drexel University men and women’s squash teams looked to continue their winning streak against Columbia University Feb. 1. The men also faced the United States Naval Academy Feb. 2. Against the Lions, the men’s team did not have a breeze like they did against Colby. The only win they received was from freshman Matias Knudsen, who defeated James Wyatt 10-12, 11-7, 11-9, 11-3. He lost the first game, but that gave him the jolt he needed to win the next three and the match. Freshmen Filip Krueger and Noel Heaton were also in the spotlight as they moved up to the third and fourth place, respectively. However, this change did not help their chances to win this match, as they both lost in four games. Both of them played highly contested matches, but none were enough to give a win to the Dragons. The captain of the team, senior Bransten Ming, was the last to play and was the closest to giving Drexel another win. He took Velavan Senthikumar to five games, coming back in two games to level out the match at 2-2. However, he couldn’t come up with another win in the last game, and lost the match, leading to an 8-1 Drexel loss. The women had a slightly better outcome against Columbia. In the first match, we saw an all out effort from sophomore Stephanie Ryan as she took the match to five games. She quickly got to a 2-0 lead, but in the third game, her opponent gained some traction and won the next two. In the last game, Ryan took out the last of her effort to squeeze past Doria Chen 11-5, 11-1, 9-11, 12-14, 11-9. Up next was junior Anna Hughes who had a tough opponent in Habiba Mohamed. Hughes struggled in the beginning, losing the first game. She got into a groove in the second, and ended up winning it. However, Mohamed won the next two games and took the match. In the second round of matches, senior Apoorva Addepalli was the highlight of the grouping, as she took her match to five games. She lost in the beginning as Pranjali Sharma took the first game, but got into a rhythm and won the next two games. She slipped up in the fourth game, but recovered very well to take the fifth game and the match. Sophomore Mariam Kamal also took her match to five games, but she could not hang on by the end and lost the match. Sophomore Ona Prokes didn’t get off to the best start, losing the first game, but ended up bouncing back in the second to win and tie the match. However, in the third match, she played a hard game, as she and Jane Pincus took it to the 14th point. It was here that Prokes slipped up, and that led to the next game, as she lost three games to one. Senior Fiona Power asserted her position as captain to get a win for the Dragon in four games. She won the first two, but had a blip in the third. This was just fuel to the fire, as she came back and won the last game and the match. Freshman Brooke Herring played the best match of the day, as she won in straight sets. Sophomore Hannah Blatt had the opposite outcome, as she lost in straight sets and brought the Lions to slightly edge the Dragons, 5-4. The men’s team took their devastating loss to heart and bounced back against Navy, winning 7-2. Knudsen went to work again this match, winning his match in straight sets. Heaton took his Columbia loss and used it to fuel his four-game win against James Kjorlien. Senior Luke Willemse took his match to five games, as he won his first two but ended up losing the next two. He got to a 10-7 lead in the fifth game, and while his opponent tried his best to challenge him, he wouldn’t give up and won 11-9, 11-6, 3-11, 9-11, 11-9. Junior Nathaniel Chan won his first match for the team at the No. 9 position, 11-5, 14-12, 9-11, 11-5. Krueger had a slow start, but he got better each game to eventually get the win. Ming had a similar outcome, as his slow start led to a strong ending and win. Sophomore Dylan Kachur followed a different path for his win. He started strong, winning the first two games, but could not follow through with the sweep. He came back and fought hard in the fourth game to win in extra points. The squash teams will have their last regular season matches Feb. 9 against George Washington University in Washington, D.C.